My doctors knew i was headed to Zion NP to do some hiking. Difficult and strenuous off-trail hiking. They were unanimous that I should not do any hiking in order to allow my injured knee to heal. So I didn't do any hiking. At least, nothing that I would normally call hiking. Instead, I explored areas that interest me, and the difficulty level is 0. There is a canyon and slickrock face that I want to hike on the east side. They're new to me and I haven't found an obvious access route. It's on the south side of the road (highway 9) just west of the 2nd tunnel. 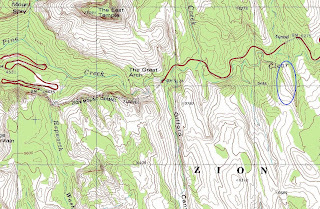 Here's a Bing map centered on the slickrock face. 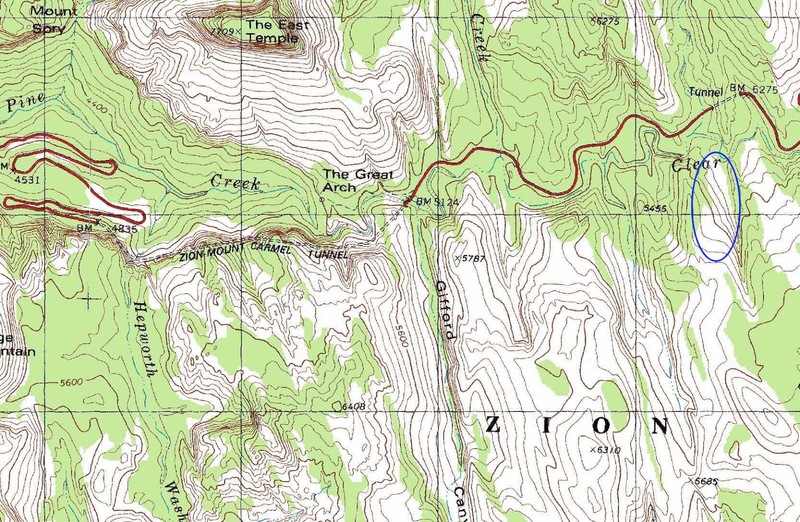 It's circled in blue on the topo map below. I want to hike this for two reasons. First, I am always looking for new routes to reach the area just west of Lost Peak and onwards to the cliffs above Parunuweap Canyon. I've already hiked several routes and this looked like another possible route. Second, this slickrock face has a feature half-way up that I call the balcony. A small flat area that might be attractive for big horn sheep to sleep at night. I want to visit that spot. I simply hiked (walked) down to the dry Clear Creek creek bed and walked around looking for an easy route to get up the other side (that is mostly 20 foot cliffs). The locals have posted a warning to trespassers? Luckily, I found exactly what I wanted. Ascending this short slot let me reach the base of the slickrock face. Cool. Here's a few shots of the slickrock face I'll hike after my knee heals up.